**** Chosen by Winner: James L.
White River Knives FC4 ($240) is designed for heavy use in real survival situations these also make excellent camp, hunting, backpacking or utility knives. The deep finger choil protects fingers while applying pressure whittling, cutting or chopping. Atop the blade is a notch for efficient striking of a ferro rod and one is included with each knife. Features a polished stainless steel divot for use with a fire bow. This is a well-designed, great looking, and robust knife intended for serious work. The White River Knife & Tool FC3.5 - Treestand Camo Paracord ($110) is designed for heavy use in real survival situations, this knife stands alone or makes an excellent companion knife to the larger knives in the series. 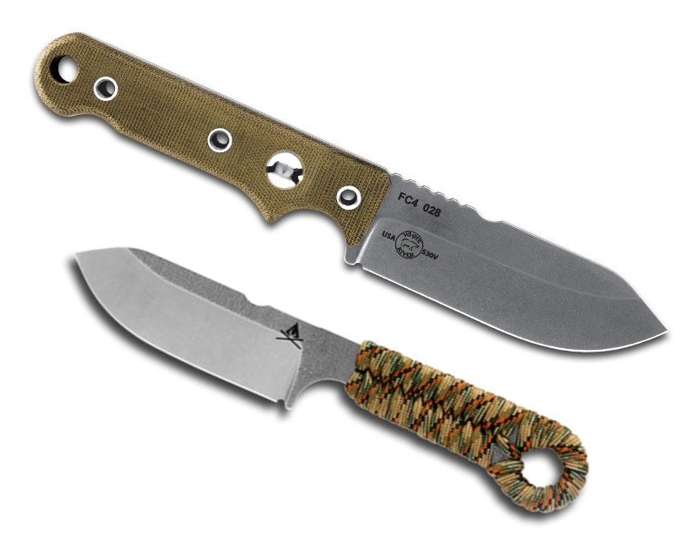 It's compact enough to allow for every day carry, camp, hunting, backpacking or utility knives. Atop the blade is a notch for efficient striking of a ferro rod, and one is included with each knife. The smallest of the FIRECRAFT series, the FC3.5 comes pre-wrapped with 550 paracord to allow for a comfortable grip, and the cord could be removed from the handle to be used in an emergency survival situation. Both blades are CMP S35VN stainless steel. Each FIRECRAFT knife is outfitted with a rugged Kydex sheath system designed to be mounted in a variety of positions. Carried vertically, horizontally, or attached to other equipment, the sheath system offers you options. We are a small family company with a passion for making high quality knives and tools in the U.S.A. Custom Quality matters to us. Which is why we precision grind, hand finish, and leather hone every razor sharp knife we make. Customer Satisfaction matters to us. Which is why we guarantee every knife for life. If you are not 100% satisfied with your White River Knife, return it for repair or replacement, free of charge, no questions asked. And, American Made matters to us! Every single component – from our steels to the thread in our American made leather sheaths is sourced and produced in the U.S.A.